Jim Fredrickson, a geomicrobiologist and Laboratory Fellow at the Pacific Northwest National Laboratory, will serve on a planning committee for "The Chemistry of Microbiomes," a seminar series hosted this fall by the Chemical Sciences Roundtable. The roundtable is a forum sponsored by the National Academies of Science, Engineering, and Medicine. On the roundtable board is Allison Campbell, Associate Laboratory Director for Earth and Biological Sciences at PNNL. Fredrickson was recommended to serve on the committee in light of his expertise in geological environmental microbiomes. 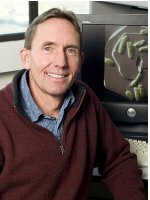 From 1991 to 2001, he served as coordinator for the Deep Subsurface Microbiology Subprogram within Department of Energy's Subsurface Science Program and he served as Chief Scientist for DOE's Genomics: GTL Program from 2005 to 2009. "The chemistry of microbiomes is part of the natural progression from censuses of the organisms present in microbiomes towards a mechanistic understanding of how microbiomes work," said Frederickson. The work they do is largely carried out by their coordinated metabolisms and has far-reaching impacts on many aspects of our daily lives, ranging from human health to our food and nutrient cycling in the biosphere." He added, "All of these are essentially microbial chemistry in action." The multidisciplinary, public seminar series will occur one day each month from September to November. One microbiome system will be covered each month. The series finale in December will feature a speaker whose research crosses multiple microbiome systems. Those in the Washington, D.C. area will be invited to attend in person. Others will be invited to watch a live webcast, which will be archived on the Chemical Sciences Roundtable website. The final product, Proceedings of the Seminar Series, will include individually-authored papers from each speaker. DOE and the National Science Foundation are sponsoring the series. Jim Fredrickson will serve on a planning committee for “The Chemistry of Microbiomes,” a seminar series hosted this fall by the Chemical Sciences Roundtable. The series will highlight the fundamental mechanisms that microbial communities use to communicate, to affect their environments, and to facilitate other functions.